What to do with the battery of an electric car during a crash? Bosch is presenting an interesting concept in US patent application publication 20170253114 which published earlier this week. In essence, the Bosch engineers are concerned with the relatively large mass of the battery in an electric vehicle. Which makes sense: The kinetic energy of an object is directly proportional to its mass. So if 30% of an EV’s mass is in its battery, so is 30% of its kinetic energy. And rapidly decelerating the battery during a crash causes large forces. 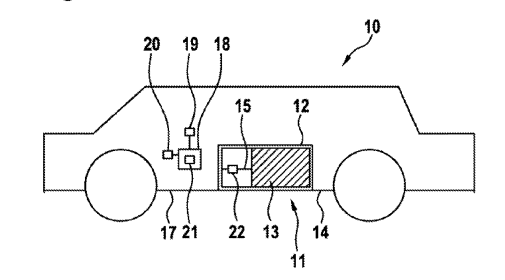 So, the idea goes, the battery should be connected to the vehicle body with a novel kind of attachment which includes a fluid that can be displaced during a crash, thereby controlling the deceleration of the battery. I love the simplicity of the idea and the basic physics behind it. Certainly more creative than many other applications I have been reading.